Students also have the option of expanding one or both clusters into a minor or even another major. This allows our students to take ownership of their academic program within a flexible framework and study what they love. Students are also required to complete the primary writing requirement. *Engineering students are only required to take only one cluster in another field. Clusters are three-course sequences within a division (humanities, natural sciences, and social sciences) or department. Students have the opportunity to choose among hundreds of faculty-designed clusters or to modify and even custom design their own cluster. See the cluster search engine for a complete list of available clusters. See the primary writing requirement page for more information. 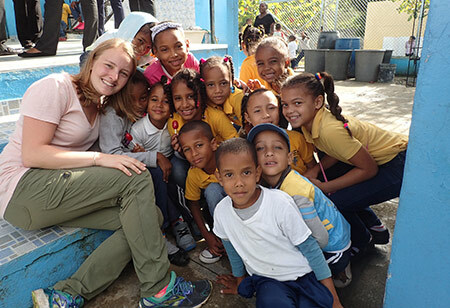 Eva Hansen ’18, a biomedical engineering student at the University of Rochester, has traveled to the Dominican Republic twice with the University’s Engineers Without Borders (EWB) student chapter. While there, she helped provide an elementary school with access to clean water. Because of the unique design of Rochester’s undergraduate curriculum, Hansen has been able to augment her major and EWB experience with a “cluster” of courses in public health. Read more about her experience, and the Rochester Curriculum in the article The Rochester Curriculum: Freedom, with intentionality. 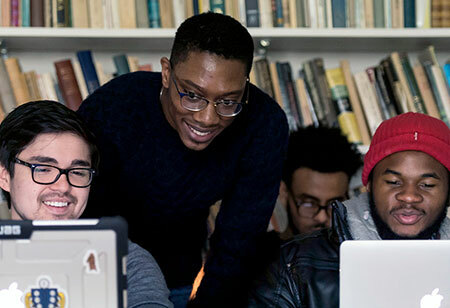 Courtney Thomas, Jr, ’18, center, created his own neuroeconomics major. He is also a double major in international relations and a Kauffman Entrepreneurial Scholar. Read more about his experience in the article The Rochester Curriculum: Creating their own majors. Michael Lin ’21, an English and business student, chose to attend Rochester because it gave him the freedom to study what he wanted.